This is the latest Isabel Dalhousie novel from one of the world's most prolific novelists. 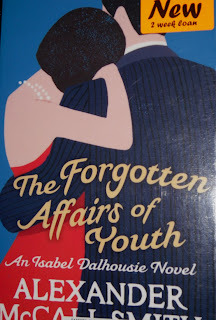 It's only a couple of weeks since I read the latest 44 Scotland Street novel (I know these are serialised in The Scotsman so it's been nearly a year in the writing) & there's a new Professor Von Iglefeld novel out soon, Unusual Uses for Olive Oil. My favourite series are the Edinburgh series. I love the atmosphere of Edinburgh in these books. 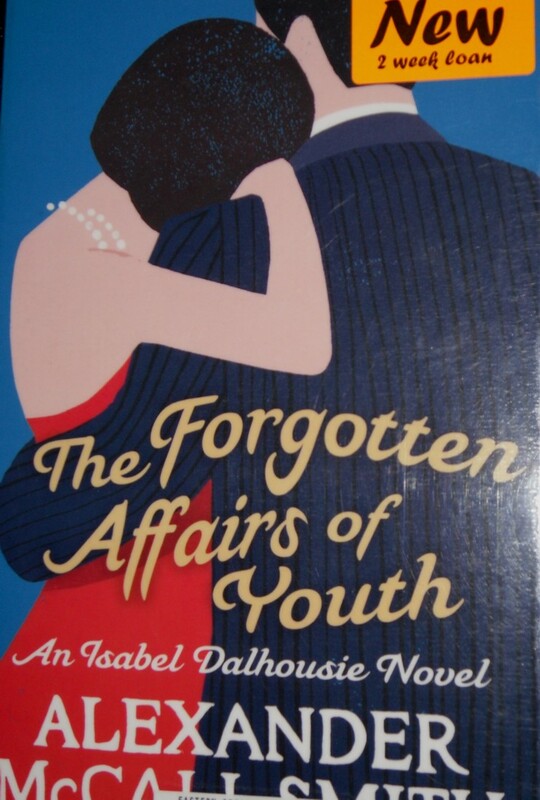 Isabel Dalhousie is a wealthy woman, a philosopher, living in Edinburgh with her fiancé, Jamie & their young son, Charlie. Isabel is the owner & editor of a journal, the Review of Applied Ethics, & her life as a philosopher influences every area of her life. Isabel is always aware of her good fortune. Her inherited wealth makes her slightly uncomfortable & she is very sensitive to the feelings of others. In this latest novel, Isabel seems to have stopped questioning her good fortune in relation to Jamie & is just enjoying being in love. Jamie is younger than Isabel & was once the boyfriend of her niece, Cat. 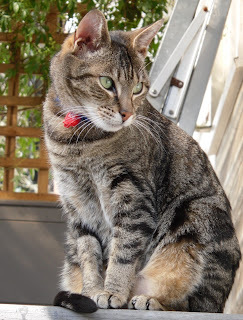 Although Jamie & Cat had broken up by the time he fell in love with Isabel, Cat has always resented their relationship & it hasn't made their already spiky relationship any easier. The fact that Isabel goes down with mild food poisoning after eating mushrooms bought at Cat's deli doesn't help either - or the fact that Isabel can't bring herself to lie to the food inspector when asked where she bought the mushrooms. Isabel often finds herself involved in the problems of friends & acquaintances. She's discreet & genuinely wants to help so she finds herself asked to investigate tricky problems. Jane Cooper is an Australian academic spending her sabbatical year in Edinburgh. She chose Edinburgh partly because she was born there & adopted as a baby. She's about to turn 40 & wants to find out about her parents. Jane knows that her mother, Clara Scott, was a student who died in an accident about eight years after Jane's birth, but she knows nothing about her father. Isabel agrees to help & starts making enquiries. Isabel soon discovers a possible candidate, Rory Cameron, who had been Clara's boyfriend at the time. When she visits him, she discovers a disappointed man whose life had been one missed opportunity after another. He is thrilled to learn that he has a daughter & Isabel arranges for Jane & Rory to meet. But, it's not as simple a story as Isabel first thought & when she begins to have doubts, she has to decide how much to tell Jane about what she discovers. Along the way I always enjoy being part of Isabel's privileged, well-ordered life. Her housekeeper, Grace, is a touchy but warm-hearted woman who goes to spiritualist meetings. When one of the spirits recommends investing in West of Scotland Turbines, Isabel is intrigued enough to ask advice. What is she to think when she invests & the shares go up? Is Grace right to have such faith in mediums & their messages? Then, there's Isabel's ongoing tussle with Professor Lettuce over control of the Review. Isabel's coup in buying the journal is still resented by Lettuce who sends her a paper written by his nephew, Mark, & virtually dares her to reject it. When Isabel meets Mark to discuss the article, she learns a lot about Professor Lettuce - some of it surprising. The readers who commented on my post about the last Isabel novel, The Charming Quirks of Others, will be pleased to know that I looked for mentions of Charlie's Macpherson tartan rompers & couldn't find any. Of course, it could be that he's too old for rompers now that he's started playgroup, but the only reference to Macpherson tartan was the kilt Charlie wears on a very special occasion. I always look forward to a few hours spent in Isabel's company. 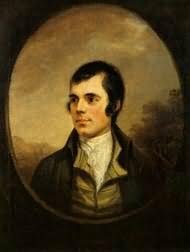 I've chosen Robert Burns (picture from here) again today. Where would Scottish love poetry be without Burns? The young man in this poem seems quite languidly obsessed by his beloved, I imagine him sighing as he thinks about her & waits for her to notice his obsession. And write how dear I love thee! Till then - and then I love thee! Jennie Gerhardt is the daughter of poor German immigrants, living in Columbus, Ohio in the 1880s. She & her mother find work as cleaners at a big hotel in the city. Jennie catches the eye of Senator George Brander who takes an interest in her. Brander helps her family by employing Mrs Gerhardt to wash his laundry & giving the family other gifts. Brander is a lonely man, about to lose his seat in the Senate & he genuinely cares for Jennie & even plans to marry her – after she’s been suitably educated, of course. Mr Gerhardt is a sternly religious man who works hard for his family but doesn’t have much sympathy for his children. Mrs Gerhardt is a much more loving, sympathetic character & the close bond she shares with Jennie is one of the most important relationships in the book. When a neighbour tells Gerhardt about Brander’s visits to the house & that Jennie has been seen out driving with him, he is furious. He confronts Brander & forbids Jennie to see him. Soon after, Jennie’s brother, Bass, is arrested for stealing coal from the rail yards & when Jennie goes to Brander for help, he seduces her. He leaves next day for Washington, promising to return & marry Jennie but he dies of typhoid & Jennie discovers that she’s pregnant. Her father turns her out of the house but Bass & her mother contrive to look after her. When Gerhardt has to seek work in another town, Jennie goes home & her baby daughter, Vesta, is born there. Jennie's family go through some hard times & she moves to Cleveland with Bass to look for work, leaving Vesta behind with her mother. Surprisingly, her father becomes besotted with his granddaughter, insisting on having her baptized & looking after her devotedly. Jennie begins working as a maid for a rich family & she is pursued by a friend of the family, Lester Kane. Lester is in his 30s, working in his father’s carriage making business but a little bored & at a loose end. He’s not interested in marrying any of the suitable young ladies of whom his family approve. Lester’s relationship with his brother, Robert, is also difficult. They have completely different temperaments & Robert’s ideas for running the business don’t always meet with Lester’s approval. Lester & Jennie are immediately attracted to each other & she eventually agrees to go to New York with him & become his mistress. Jennie tells her mother the truth but lets her father think she’s going to be married. She doesn’t tell Lester about Vesta & the longer she waits, the harder the confession becomes. Jennie finds it easier to convince herself that she can keep Vesta a secret & that her father doesn’t need to know about her unmarried state. She knows that she is not being honest but she’s frightened of the consequences. Both Lester & Jennie are indecisive & this drifting is one of the main problems in their relationship. Lester isn't just a rake, he loves Jennie but not enough to defy convention & marry her. He enjoys Jennie’s company & is proud to be seen with such a beautiful woman although he’s careful to keep Jennie in the background of society, setting her up in houses in different towns where he can visit her on business trips. He admires her virtues even while he takes advantage of her, & refuses to give her the status of his wife. She’s a woman of a curious temperament. She possesses a world of feeling and emotion. She’s not educated in the sense in which we understand that word, but she has natural refinement and tact. She’s a good housekeeper. She’s an ideal mother. She’s the most affectionate creature under the sun. Her devotion to her mother and father was beyond words. ... She hasn’t any of the graces of the smart society woman. She isn’t quick at repartee. She can’t join in any rapid-fire conversation. She thinks rather slowly, I imagine. Some of her big thoughts never come to the surface at all, but you can feel that she is thinking and that she is feeling. After her mother’s death, Jennie brings Vesta to live near her & when the child falls ill, Jennie is forced to tell Lester the truth. Surprisingly he accepts Vesta & the three of them live happily together for some time. Lester is careful to keep their relationship secret but rumours get about & when his family discover their relationship, they disapprove. 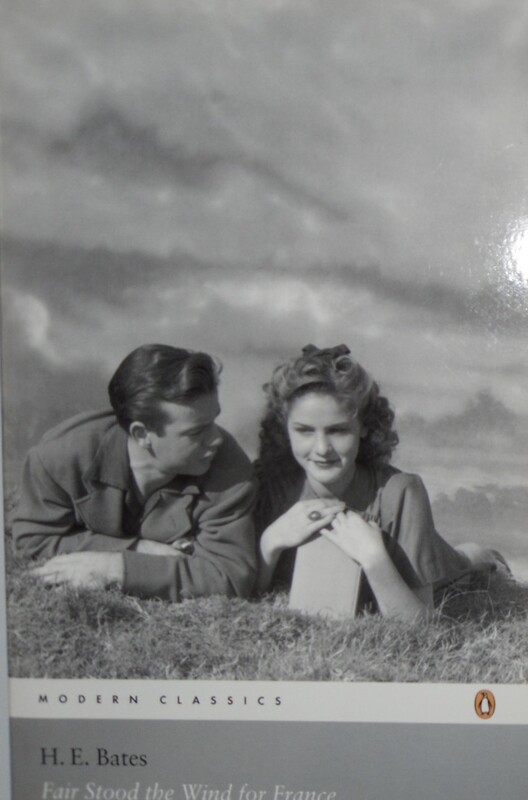 His parents are especially upset & try to convince Lester to leave Jennie & marry someone “suitable”. He refuses but feels increasingly uneasy about his inability to make a decision about his future. His father dies & the will virtually disinherits Lester unless he leaves Jennie or leaves him with enough to live on if he marries her. It's the difference between $10 000 a year & millions. A lot of the story is about Lester's dilemma, he just doesn't have the moral courage to carry out the logical end of his actions. Jennie is a good woman & it's easy to see how she gets involved with Lester who loves her & looks after her family, even having Mr Gerhardt to live with them after the family breaks up after Mrs Gerhardt’s death. Jennie is portrayed as quite spiritual & morally pure. Everything she does is the result of love. She gets involved with Brander because he looks after her family. She falls in love with Lester but she knows that she has no other way to get out of poverty than to live with him so she allows her emotions to lead her into a relationship that her family morally disapproves of. Jennie loves Lester & can see his dilemma. She offers to leave him so that he can please his family but perversely he refuses to let her go. Lester just ties himself up in knots thinking about what he should do. The crisis comes after his father’s death when he is shut out of the family business & begins to speculate with his money. Then, he meets an old flame, now a wealthy widow, & still in love with him. The decision he makes will affect the rest of his life. This is such a beautifully-written book. Dreiser doesn’t judge any of the characters. He allows us to understand Mr Gerhardt’s religious intolerance, Lester’s indecisiveness & all Jennie’s decisions as a part of the period in which they live. Jennie’s life is constrained by the fact that she was a poor woman in the 1880s & 1890s.Her poverty & lack of education meant that she had few choices. In Dreiser’s eyes she remains pure & good, even after she has been seduced by Brander & then Lester. Brander & Lester are also constrained by society’s expectations, they are not just moustache-twirling villains. Jennie Gerhardt is an involving story, I read most of it in a couple of days, I couldn’t put it down. I’m very glad that my 19th century book group chose to read it & I’d like to read more of Dreiser’s novels..
Linda has published Untying the Knot as an e-book for the Kindle. Her previous novel, House of Silence was published as an e-book in April & has been a great success, selling over 12 000 copies. Linda has written about her experience of e-publishing on this blog here & also on Dani's blog, A Work in Progress. Dani has also reviewed Linda's earlier books, Emotional Geology & Star Gazing which I've read & loved in my pre-blogging days. 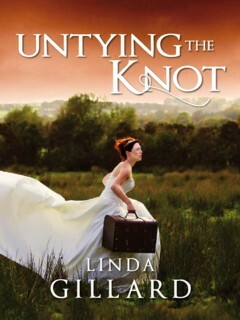 There are links to lots more reviews of Untying the Knot at Linda's excellent webiste here. You can buy Untying the Knot for the Kindle at Amazon UK or Amazon US. It was a lovely early Spring weekend in Melbourne & one look at the garden told me that the time had come to sweep the drive & do a little weeding & cutting back. Lucky & Phoebe came out to help, supervise & explore. 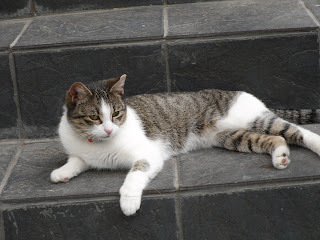 & relaxing on the front steps. 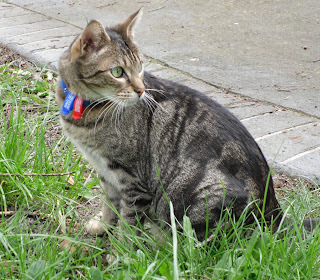 Lucky, on the other hand, was content to follow me around, eating grass & enjoying the fresh air. These photos pretty much sum up their very different personalities. Lucky is much quieter, happy to follow me around & sit on my lap when I settle down with a book & cup of tea. 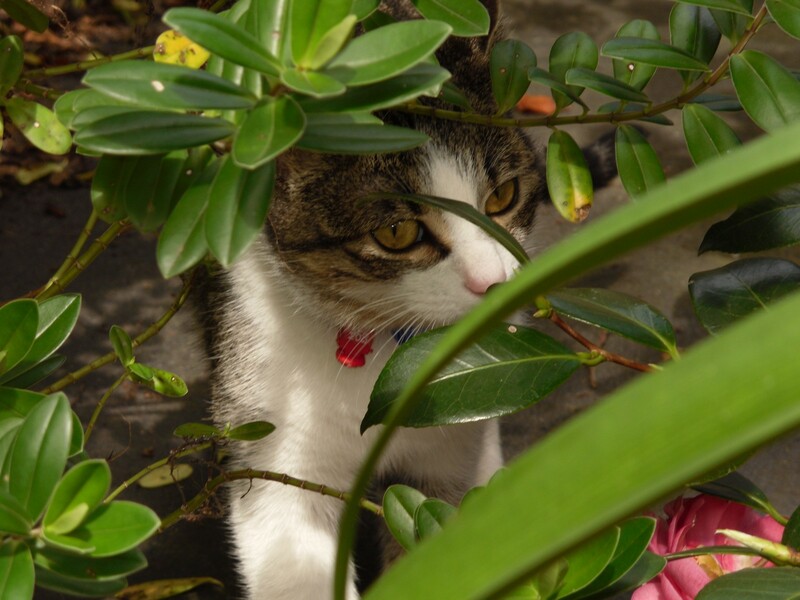 She's much less nervous than she was when she first arrived & she & Phoebe get on quite well, especially now that they have the garden to roam in & can get out of each other's way when necessary. Phoebe is a daredevil. She's already given me several (more) grey hairs. She fell from the roof of the back porch last week. Luckily she grabbed on to the handrail of the back stairs & I was able to rescue her. It's a long way to the ground. She's also disappeared over the back fence a couple of times & I've been nervous about where she was. 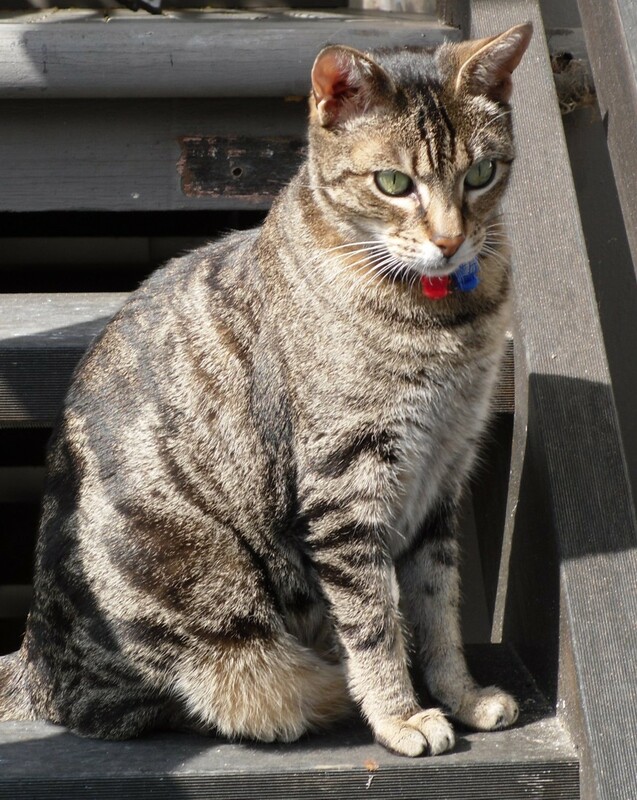 But, she's always come home &, if she did get lost, she's tagged & microchipped so I just try not to worry too much. After all, they're out all day when I'm at work & I have no idea what they're getting up to. It's lovely to sit on the couch in the evenings with Lucky on my lap & Phoebe asleep beside me, exhausted by another day of climbing & exploring. The cats, that is, not me. Librarians don't do much climbing or exploring. I haven't been able to find out very much at all about this week's poet, Alexander Scott. He lived near Edinburgh in the 16th century, there are about 35 poems attributed to him, including this one, A Rondel of Luve, & that's about it. I couldn't find a picture of him so I've chosen a painting by one of my favourite Scottish artists, Sir Henry Raeburn. 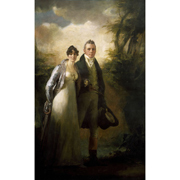 The period is wrong but I like this portrait of Mr & Mrs Robert Campbell of Kailzie (from here). They look happy & contented as they walk through the grounds of their home. Although Scott is pretty gloomy on the prospects for happiness in love, I think the Campbells may have achieved his ideal - to lufe and be wyiss. Lo! what it is to lufe. Lufe is ane fervent fyre. Both lufe and to be wyiss. 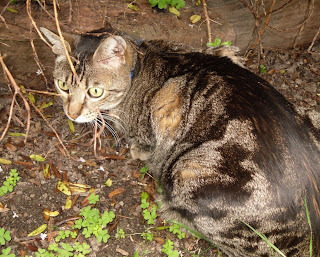 Flee alwayis frome the snair. At the end of Miss Buncle's Book, Barbara Buncle marries her publisher, Arthur Abbott, & starts a new life. Hopefully a less controversial life as Barbara's career as a writer has led to unintended complications & a midnight flit from her village home. Some months later, the Abbotts, although blissfully happy with married life, confess to each other that their busy social life of bridge evenings & drinks parties, bores them silly. Arthur suggests they move to the country & Barbara embarks on the exhausting task of house hunting. Arriving in the small town of Wandlebury to view the Archway House, Barbara is mistaken for another client, given some very expensive port to drink & virtually commanded to read a will with some very curious clauses. The will of Lady Chevis Cobbe, owner of Ganthorne Lodge, leaves everything to Jeronina Mary Cobbe, provided she is unmarried at the time of Lady Chevis Cobbe's death. If she is married, Jeronina's brother, Archibald, will inherit. Once the mix-up is sorted out & Barbara's true identity is established, she views the Archway House, falls in love with it & sets about renovating & reviving the lovely but dilapidated old house. Life in Wandlebury is just what Barbara has been looking for. She soon hears more about eccentric Lady Chevis Cobbe who won't even have a married servant in the house & is definitely unbalanced on the idea of marriage for any of her family. One of Arthur's old Army friends, Monkey Wrench, turns out to be the local GP. Artist James Marvell, his wispy model wife & their three tearaway children live next door. Barbara soon meets Jeronina Cobbe, known as Jerry, a practical young woman who makes ends meet at her rundown house by running a riding stable & school, while her selfish brother, Archie, skives off work & sits around waiting for the inheritance he thinks his rich aunt is going to leave him..
Arthur's nephew, Sam, who works in the publishing business, comes down for a visit & is immediately taken with Jerry. Unfortunately, she's heard that he's a nightclub-loving, irresponsible, burn the candle at both ends town lover, so she tries to ignore her growing interest in him. Jerry loves the country & could never be happy in town. Sam grows increasingly desperate trying to attract Jerry's attention. His efforts aren't helped by Barbara who knows the terms of Lady Chevis Cobbe's will & does everything she can to keep the potential lovers apart so that Jerry won't lose her inheritance. Miss Buncle Married is a lovely, domestic book with lots of humour & acute observation. Barbara is an innocent whose best efforts often end in disaster. Hiding Sam's trousers so that he can't leave the house to visit Jerry has unintended consequences. A dinner party at the Marvells' begins awkwardly & doesn't really improve, even when Barbara goes off to inspect Mr Marvell's studio. The Abbotts and the Marvells had not very much in common. Mrs Marvell never bothered to talk for talking's sake, and Barbara was an observer rather than a conversationalist. She liked to be with people who talked a lot, so that she could listen, or not, as she felt inclined. Mr Abbott knew nothing about Art. Mr Marvell knew nothing about Business. It was all rather difficult. Marvell is fascinated by Barbara. Her total innocence & lack of guile entrance him. While they enjoy an intimate conversation about Art & Life in the studio, Arthur struggles to talk to Mrs Marvell, who is always exhausting by posing for her husband & lies languidly on the divan, not bothering to talk or try to entertain her guest. The Abbotts leave early when ping-pong is suggested as an after-dinner entertainment. Barbara is suddenly inspired to start writing again. She shuts herself away writing a new novel called There's Many a Slip, basing her story, as before, on her new neighbours. Arthur loves the book & foresees even greater sales than the other books written by "John Smith". He especially enjoys the plotlines that he thinks Barbara has made up, like the woman who reads a will not meant for her eyes, but Barbara is horrified at the thought of publication. Her characters are only thinly veiled, after all, & she would hate to have to leave Wandlebury as she'd left Silverstream. The manuscript is locked away and, with the book out of her system, Barbara decides that John Smith has written his last word. There's a third book about Barbara Buncle called The Two Mrs Abbotts. Set during WWII, it's another great read, about the Home Front & the stresses of making do with very little & worrying about loved ones fighting overseas. I listened to it on audio a year or so ago, not realising it was about Barbara Buncle until she turned up in an early chapter. 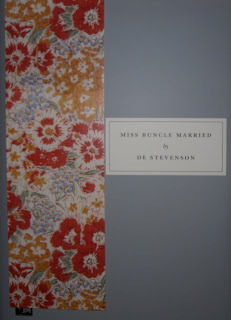 It was good to read Miss Buncle Married to fill in some of the gaps in the character's lives. I enjoy D E Stevenson's books & she's having a little mini-revival at the moment with the Persephone editions of the Miss Buncle books, the recent Bloomsbury reprint of Mrs Tim of the Regiment & Greyladies publishing some previously unknown novels. Apart from Bertie Plays the Blues, I can't remember the last modern novel I read. I've found myself mostly back in the 19th century with occasional forays into the early 20th. I also haven't read any non-fiction for some time, George Orwell's Homage to Catalonia was the last, over a month ago. Reading the many Persephone titles written during WWI & WWII has spoiled me for modern fictional recreations of those times. I love reading a book where the author didn't know how the war would end. It gives the story such tension & immediacy, the same kind of immediacy I get from reading diaries & letters of the period. Fair Stood the Wind for France is by H E Bates, probably better known these days for his Darling Buds Of May novels about the Larkin family. It's the story of John Franklin, a bomber pilot & his crew, forced to land in Occupied France on the way home from a raid. The camaraderie of the crew is quickly established as a routine flight home almost turns to tragedy when an air-screw comes loose & they have to make an emergency landing. Franklin lands in a marsh & while the others are uninjured, his arm is badly damaged. They set off to make their way south to Spain & home. When their food runs out, & Franklin's injury is slowing them down, they realise they will have to ask for help. They come to a mill where a young woman doesn't hesitate to take them in, feed them & hide them until her father can arrange for their escape. Franklin realises how dangerous their presence is. If the Germans find them, the airmen would be taken to a prison camp, the family would be shot. He did not know what to say. He felt small because of her simplicity and the great assurance behind the simplicity. She did not speak for a moment or two either. He knelt there looking at her sideways, watching her black hair curl against her face, and the lips firmly and quietly set in the shadow of her hands. As he knelt watching her the feeling of being watched and followed by someone no longer meant anything. It slipped away and seemed ridiculous. The hard tangle of events was smoothed away, too, with his fear. The rain woke in him, as nothing else had woken in him, all his feeling for England. It was a longing deeper, at that moment, than his feelings for the girl; deeper than the mere desire for escape; deeper than the war, the things the war had done, and the desire for the war to be over. As he stood there all the memory of rain in England washed down through his blood and steadily increased the ache of homesickness until he was suddenly and utterly tired of the mill, the house, the river, and the flat French plain, tired of the smell of France, of speaking and thinking another language and, above all, of the complications. He felt all the Englishness of himself washed bare to the surface, clean and clear and simple as the rain. This is a very understated novel.The terror of living under Occupation, the arbitrary nature of justice when 100 people can be taken hostage & 50 of them shot because a labour gang killed a German overseer. The fear that every visitor to the mill could be a spy. All this is conveyed very simply & unsensationally yet the atmosphere of long, hot summer days is always undercut with tension. The change of pace when Franklin & Françoise start on their journey is startling. I read the last half of the book in one sitting, I couldn't put it down. I loved this book & I'd recommend it to anyone who has read other novels & memoirs of the period. As I read this poem, The Generous Gentleman, by Allan Ramsay (picture from here) I couldn't help thinking about a book I'm reading at the moment. 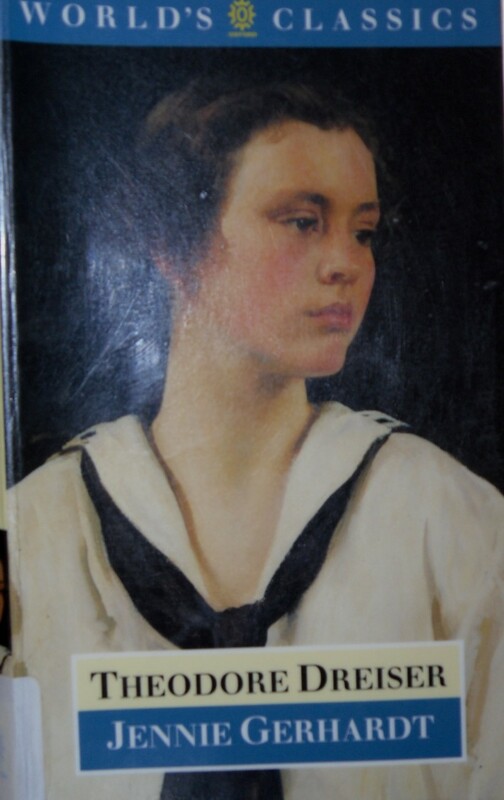 My 19th century bookgroup is currently reading Jennie Gerhardt by Theodore Dreiser. Dreiser is an author I've been aware of but haven't read until now. His most famous novel is probably Sister Carrie (filmed in the 1950s as Carrie with Jennifer Jones & Laurence Olivier). I've raced ahead & read next week's chapters already & I just wish that Jennie could meet a generous gentleman like the narrator of this poem. She hasn't had much luck so far & she certainly doesn't have the confidence & self-esteem of this young woman. I hope I'm wrong but I think Jennie is headed for more heartbreak. 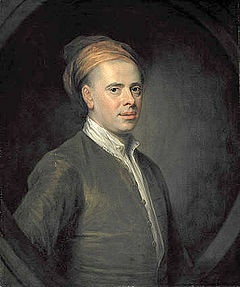 Allan Ramsay was certainly a talented & multi-skilled man. He was a wig-maker, a bookseller & a librarian as well as a poet. 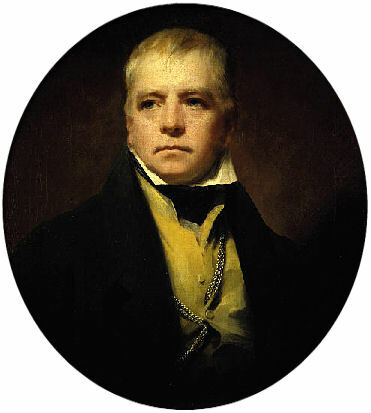 He opened the first circulating library in Scotland & promoted the reading of early Scottish verse. His eldest son was the painter of the same name. In straightness nane surpast her. She'd given clad wi' naithing. While on her sweets I doated. And but designing, charm'd me. Sir, hope for nought but kisses. Of her's pled, I should grant her. And a young lady made her. Bertie Plays the Blues is the latest instalment in the 44 Scotland Street series. I love McCall Smith's Edinburgh novels. I spent a day in Edinburgh on my one & only (so far) trip to the UK in 1999 & I've always loved Scottish history & literature so spending even one day in Edinburgh was wonderful. I went to John Knox's House, the Scott Memorial, the Portrait Gallery, stood outside Holyroodhouse (didn't have time to go in & see Rizzio's bloodstain on the floor, unfortunately). It was a lovely day. 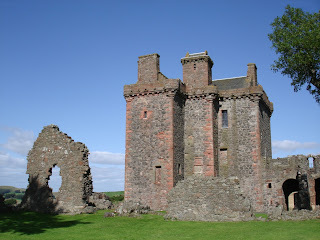 Reading the Scotland Street & Isabel Dalhousie series takes me back there. The Scotland Street books are serial novels first published in The Scotsman newspaper & then in book form. All of McCall Smith's writing is funny, affectionate, gentle & sensible. I use sensible as a compliment! There are several passages in this latest book where the author gently satirizes the tendency of the authorities to put up signs warning citizens not to do various dangerous things. Obviously they don't want to be sued but isn't it a shame that we can no longer rely on the common sense of people not to do stupid things & then, when they hurt themselves doing those stupid things, rely on them taking the blame for their own stupidity rather than suing the nearest local authority? There's so much affection for all the characters in this book that I found myself smiling as I read, often sighing with complete satisfaction. McCall Smith has often said that he's surprised & touched by the interest readers have in Bertie Pollock, the put-upon 6 year old son of ineffectual Stuart & horrendous over-achiever, Irene. In this instalment, Bertie, with the help of his computer-savvy friend, Ranald Braveheart Macpherson, decide to put himself up for adoption on eBay. Bertie hopes a nice family in Glasgow (where he has several friends) will put in a bid for him. When eBay, understandably, take down their post, the boys decide to go to Glasgow & find an adoption agency themselves. Bertie has come to the end of his tolerance for the saxophone, Italian conversazione & visits to yet another psychotherapist. He wants to play rugby & go to Cub Scouts, although even there he has to put up with Tofu & Olive. Art gallery owner Matthew & his lovely wife, Elspeth, are now the parents of triplets - Rognvald, Tobermory & Fergus. Matthew asks his former assistant (& sometime girlfriend), Pat Macgregor, to help out at the gallery so he can spend more time at home. All is going well, apart from the sleep deprivation, until Matthew removes the babies' ID bracelets & they can't tell them apart. Salvation comes in the form of an angel from Denmark, nanny Anna, who saves their sanity. Angus Lordie's engagement to Domenica Macdonald hits a snag when they try to decide where they're going to live. Domenica wants to sell Angus's flat but, as it's also his studio, he's resisting the idea. Then there's the fate of their friend, Antonia, who suffered an attack of Stendhal syndrome on a trip to Italy & is still there, cared for by the nuns of a convent in Tuscany. Big Lou, owner of the local coffee shop, is also looking for change in her life. Lou has never had much luck with men & when she decides to try Internet dating, her first date with a man with a curious job may lead to better things. Pat Macgregor accompanies Lou on this date for moral support & runs into her former boyfriend, Bruce Anderson, "surveyor, perfect narcissist, user of clove-scented hair gel, Lothario". Pat is helpless to resist Bruce but, after he is unable to meet her for dinner because he slipped on his tube of clove-scented hair gel as he got out of the shower & ended up in Casualty with a broken leg, his flatmate, Neil, arrives to save the day. McCall Smith's gentle, humorous style, is so reassuring. Even the awful characters like Bruce & Irene are treated with affection. Bruce's leg isn't too badly broken & he doesn't really mind missing his date with Pat because he's so self-involved that he's forgotten all about her already. Irene may be misguided but she loves Bertie & wants him to have the best opportunities. She just doesn't listen to him. At the end of the book, there's some hope that things are about to change for Bertie when Irene hears some home truths & buys him some jeans instead of the pink dungarees he's always hated. Like the books of P G Wodehouse, nothing too bad ever happens in McCall Smith-land. I can't wait for the next instalment. 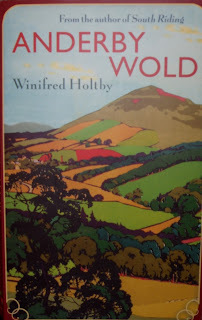 I was very excited when Virago decided to reprint three more novels by Winifred Holtby after the success of the TV series of South Riding. 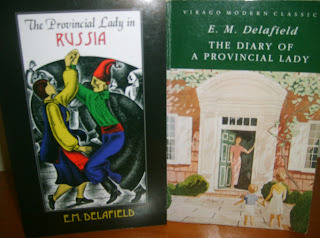 Apart from anything else, I loved the covers, based on 1930s railway posters so I ordered the lot - Anderby Wold, Poor Caroline & The Land of Green Ginger. I loved South Riding, The Crowded Street & the collection of short stories, Remember! Remember! so I was looking forward to reading more of Holtby's fiction. I also remember how jealous Vera Brittain was when Winifred's first novel was published before her own The Dark Tide. The friendship between Vera & Winifred is explored in Vera's books, Testament of Youth & Testament of Friendship as well as fictionally in The Dark Tide. Sarah watched her smile at one relation and then another on her progress to the door. It was ridiculous, the way she behaved, as though she were a queen holding a court. Well, nobody was likely to bow down to Mary, unless one counted the villagers, who were said to make an absurd fuss of her. Mary is involved in everything in the village. John is a quiet, easygoing man who defers to her judgement & never initiates an idea or topic of conversation. The farm workers are well looked after & well paid but it's Mary not John who really runs the farm. Mary's involved in everything - in decorating the Christmas tree in the village hall, organising treats for the children, charitable visits to the poor & sick, taking a leading role in everything. Her leadership & uncompromising standards have made her enemies, principally Mr Coast, the local schoolmaster, who resents Mary's dominance of local affairs. She refused to allow John to write a reference for Coast & since then, he has been rude & unco-operative. Coast is an unpleasant man, a sly domestic bully but an uncomfortable enemy in a small village. Mary's unsatisfied life is changed when David Rossitur arrives. David is a journalist, living in Manchester, but undertaking a tour of the villages of the Riding to spread his ideas about Socialism & trade unions. Mary's benevolent despotism (as he sees it) are anathema to David & they have many spirited arguments about the future of agriculture & the inevitability of political change. Mary is also personally attracted to David &, all at once, her quiet, predictable life becomes intolerable to her. Of course some people never wanted anything very much. Like John. She could never imagine John eating out his heart in longing for the unattainable. He was safe enough, securely fenced in behind his limitations. But David - David who believed in such stupid things that were bound to let him down one day, David who was such a child, who needed so much someone who could help him when the inevitable hour of disappointment came - what was one to do for him? There were some things that it was wiser not to think about. David's visit & subsequent newspaper articles lead to the establishment of an agricultural trade union in the area. The discontent of a labourer Mary had sacked & the agitations of Coast, the schoolmaster, lead to a strike at harvest time. Mary stands firm on the question of wages, believing that her offer is fair & knowing that the smaller farmers won't be able to afford to pay if she gives in. Mary's misery & frustration is increased when she doesn't hear from David & their one meeting ends in a passionate kiss that may or may not have been witnessed by John. She realizes that her obsession has blinded her to the consequences of her actions & her life will be changed completely by what follows. Anderby Wold is an intensely realized portrait of rural society that rings true. Winifred Holtby's family were Yorkshire people & she was very aware of the political changes that had resulted from the War. Her farmers & labourers are at the end of an era. The labourers will no longer be content with what the farmers are gracious enough to give them. Mary is trying to continue a tradition of patronage that is no longer wanted. She is chafing at the limitations of her life while trying to fulfill her duties as she sees them. It's also a very funny book. Sarah is a wonderful character, spiky & domineering, always trying to assert her superior knowledge of John & disapproving of Mary because she has no children. Mr Coast is a perfect portrait of a frustrated man. The scene where he plays the hymns at Sunday service too fast because he's angry & then, because the vicar asks him to slow down so the choir can keep up, plays the final hymn "like a funeral dirge, with long-drawn wails at the end of every line." is typical of his ungracious, self-sabotaging manner. I think it's a remarkable first novel & I'm looking forward to reading more of Holtby's work. I've been reading quite a bit of Sir Walter Scott (picture from here) lately. I've recently read a couple of his short stories & a novella, The Highland Widow. Then, I've just finished reading The Talisman with my 19th century bookgroup. The Talisman is one of Scott's medieval tales, set mostly at the camp of the crusaders led by Richard the Lionheart. It's a story full of disguises (there's even a disguised dog), dastardly plots & a romance between a poor Scottish knight, Sir Kenneth, & the Lady Edith, a relative of King Richard's that seems doomed because of their difference in rank. Today's poem from my anthology of Scottish love poetry is from a section called Unromantics & an unromantic lot they are. This poem, Nora's Vow, shows what can happen when a woman makes extravagant claims about what she will & won't do. I think she protests too much! I wonder what she was holding out for? And none be left but he and I. -She's wedded to the Earlie's son! The girls are very much at home now. We're all more relaxed. I've stopped worrying that Phoebe will wander or climb so high she can't get down (she may still do these things but I've almost stopped worrying about it before it happens). 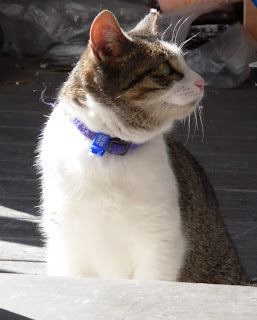 I was home yesterday so I left the back door open so Lucky & Phoebe could come & go as they pleased. It was a lovely early Spring day & they both immediately lay down on the drain where Abby always rolled around & did exactly the same thing. I decided this was a good omen. 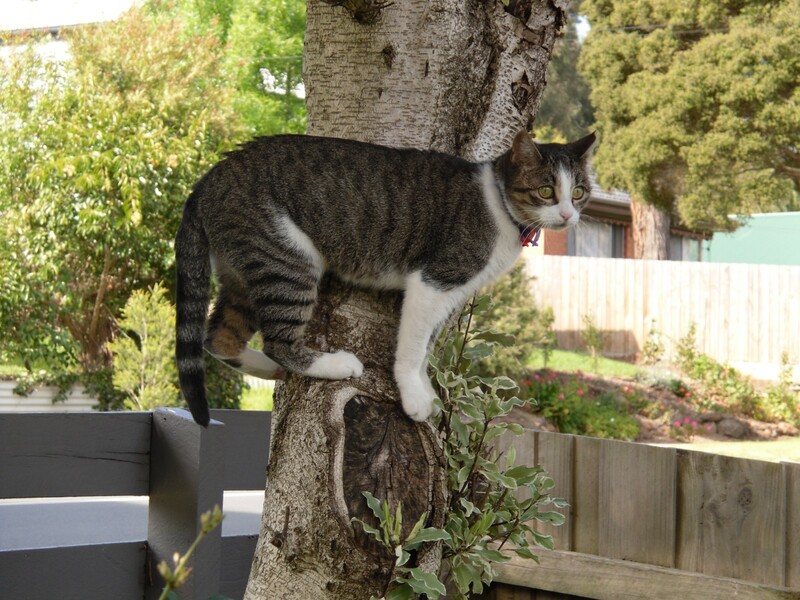 It's either something that cats just enjoy doing or Abby's spirit was guiding them to her favourite spots. 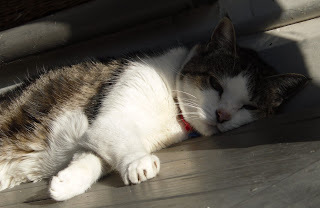 Another favourite spot of Abby's was lying on the back porch in the sunshine. Here's Phoebe doing exactly that. 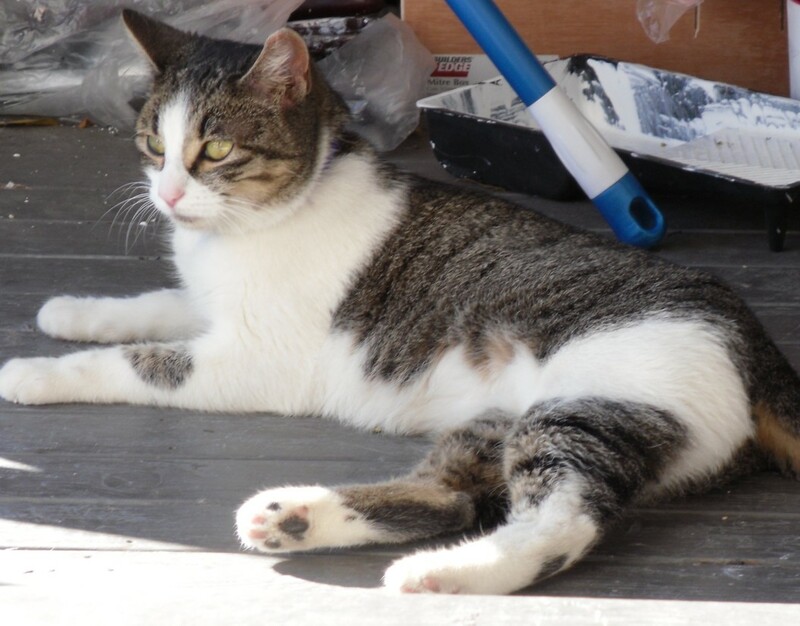 I think she has quite a resemblance to Abby which I must admit was why I fell in love with her rather than the older cat I was supposed to be looking for. Please excuse the mess in the background. My friend P is halfway through painting the laundry. And for comparison, here's a photo of Abby in the same place. 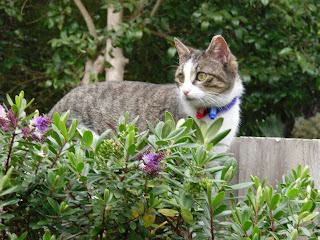 Far from daredevil Phoebe wandering far & wide, it was Lucky who went "missing" for half an hour this morning. Well, I couldn't find her anyway. Then, she came nonchalantly wandering in with cobwebs or dirt of some kind on her whiskers, so I have no idea where she'd been exploring. We've also had one cat flap lesson with more to come. It was very successful, both cats went through the flap a couple of times while I let it down over their backs so they could feel it. On Monday when I go to work, I'll leave the cat flap unlocked & hopefully they'll get the idea. 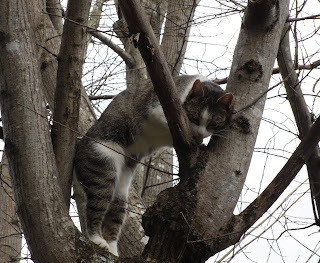 Another advantage of the outdoor exercise is that it leaves Phoebe too tired to do any acrobatics in the evening. Last night she curled up on a chair at 8.30 & never moved. I didn't see her climb anything all day.